October is almost here, the weather is getting cooler. It's time for Quilting & Sewing Classes to begin once again. To jump start our Class Schedule, we have two wonderful instructors coming in October. 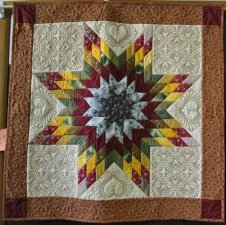 Spend the day, learning to make a stunning Lone Star Wall hanging with Jacque Paltrineri. She will be teaching an easy way to make what looks like a complicated Lone Star. Amaze your family & friends by learning to make a Lone Star Wall hanging the easy way. A Class Supply List will provide when class is paid in full. Take an hour out of your busy day to have fun making these delightful baskets. It's fast, easy, & stress free. A.J. Hudock will be teaching us the technique to make both round and oval baskets, placemats, coasters and totes. 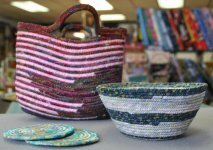 Come spend an hour for 2 evenings with us to unwind & learn to make fabric baskets. A Class Supply List will be provided when class is paid in full.